J.R.R. 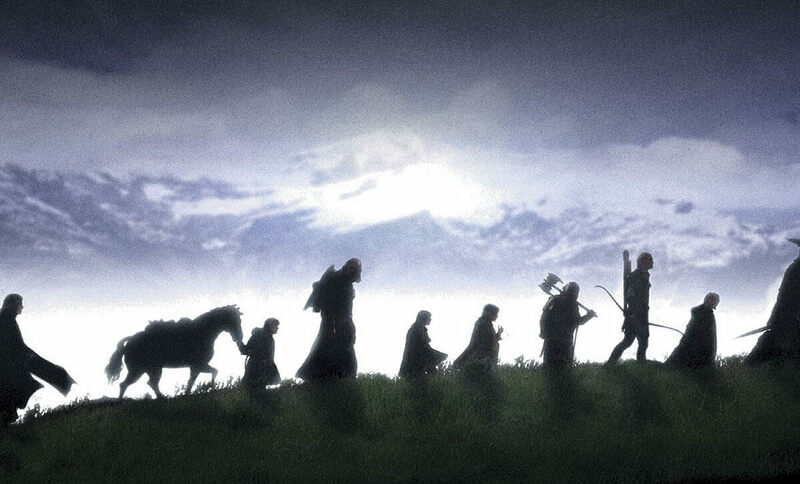 Tolkien did not consider the Lord of the Rings books to be a straight allegory. However, he instead believed that the best way to give a witness to Christ in the Lord of the Rings was to weave the ideas of Christianity, and images of the faith throughout the series from different angles and through varying lenses. He seemed to create symbols that were constantly being arranged and re-arranged throughout the series. Let's take a look at ten examples that I've noticed. Now, I'm not saying that these are the only ones, or that Tolkien intentionally placed these, though it's possible, I am saying that from my perspective these seem like such examples. I see in the opening scene of the movies a great deal of biblical imagery. You've got the forces of goodness, humanity, and elves (the sort of angelic beings of the Middle Earth universe) against an evil army of monsters, the orcs (representative in some ways of demonic forces of the spiritual realm.) And you've got a leader of the evil forces, Sauron, who is so very powerful. This is the introductory mythos of the LOTR series. Sauron has systemically deceived the peoples of middle earth through a seeming gift of rings. Each of the races take the rings, which they assume gives them authority and power. But instead, each of the rings put the leaders of middle earth under the authority of the secret ring Sauron forges, "one ring to rule them all." The symbolism here is the garden, and the fall of man. The serpent tempted the first humans to sin against God, telling them they would become gods themselves. They would have special authority. But instead, what happened in the fall was humanity was placed under the cruel authority of Satan, just like the rings gifted by Sauron were a deception, that turned the 9 leaders of men into ring wraiths, and gave Sauron ultimate power over middle Earth. Then we see this battle, where the forces of light gather together to appose Sauron, and they march on the gates of darkness. Every generation in human history has had to contend with the evil of it's age, and gather together in a unity, and march upon the gates of darkness in hope of vanquishing the evil of their age. Long, long ago was Israel and the Canaanites. I think of Martin Luther and the reformation. I think of MLK Jr. and the civil rights movement. I think of World War II when the allies rose up to push back Hitler's armies. I think of today, as we fight back against so many evils of our day. 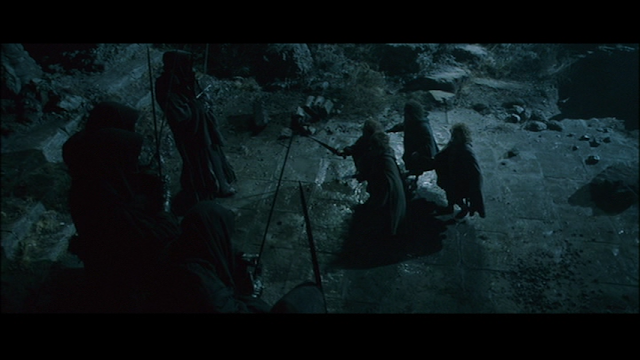 In this situation we see Frodo and the hobbits surrounded by ring wraiths on weather top. 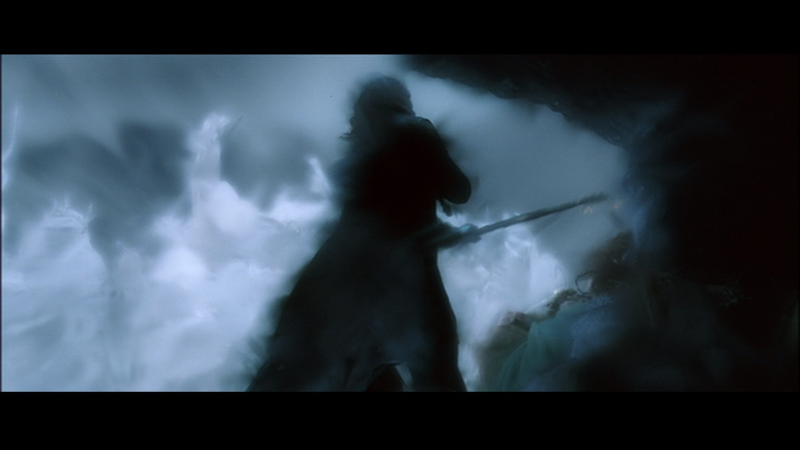 Frodo is cornered and stabbed with a nasgul blade. Here I see symbolism of the cross of Jesus Christ. Frodo represents Jesus Christ, who is pierced by Satan on the cross. We see this happen in a different realm, when Frodo puts the ring on. Frodo is stabbed and he begins to descend into darkness, slowly becoming a wraith, becoming darkness and evil... Just like Jesus became sin for his people, taking on their own darkness and destroying it in himself. Now at the moment Frodo is stabbed we see Aragorn jump into the scene, and the blade is pulled back from Frodo's heart. 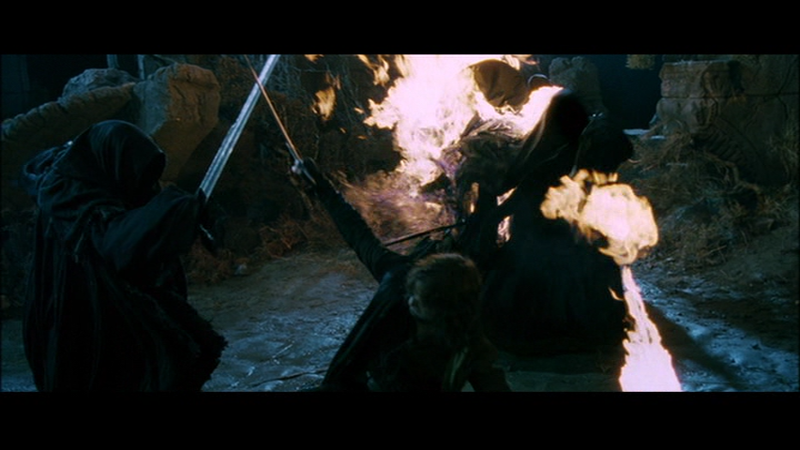 Aragorn represents God the Father, wielding a sword, and a flaming torch. The flaming torch is representative of the Holy Spirit. Now you have the god-head present. So we see Christ temporarily removed from the god-head in his death. The trinity enters to save Christ, and resurrect him from the dead. The ring wraiths are left exposed, and are defeated by Aragorn, just as the cross was a trap for Satan, and a defeat for Satan, who was robbed of much of his power through Christ's victory at the cross. Here we see more symbolism of the cross. Gandalf takes on the role of the Christ-figure, stepping between his friends and the ultimate power of evil, to declare: "You shall not pass!" Gandalf uses the Balrog's own strength against it, by damaging the bridge, block's it's attack, and the Balrog falls into shadow. 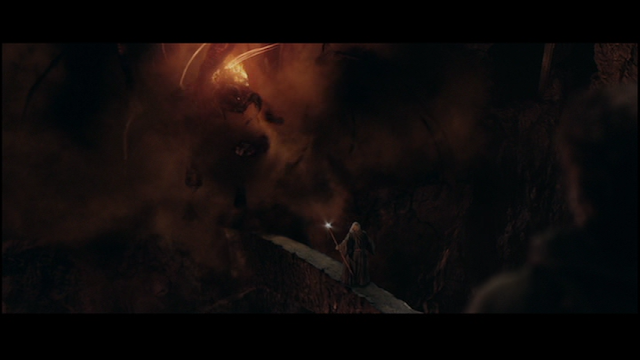 But Gandalf's foot is caught by the Balrog at the last moment. The symbolism here reminds me of the scriptures where Satan tempts Jesus in the wilderness. Satan says to Jesus that he should throw himself down and God's angels would 'keep his foot from striking a stone." Gandalf has to pay a price for protecting his friends, and he has to pay a great deal, indeed, his life, as he fights the Balrog in the lower parts of the world and defeats him. As it says in the scriptures, Jesus descended to the lower regions and set the captives free, before he resurrected from the dead. 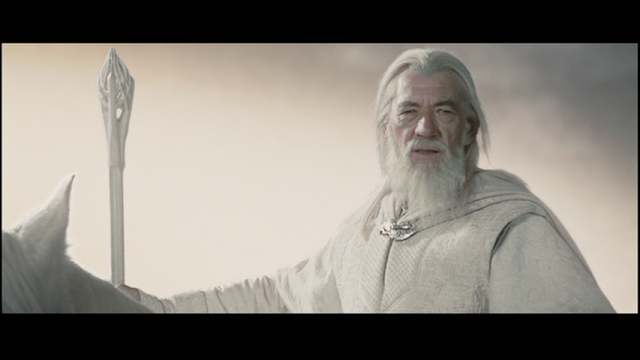 And in the same way Gandalf dies as the grey, and is resurrected as Gandalf the white. The saga of Boromir has always touched me greatly. 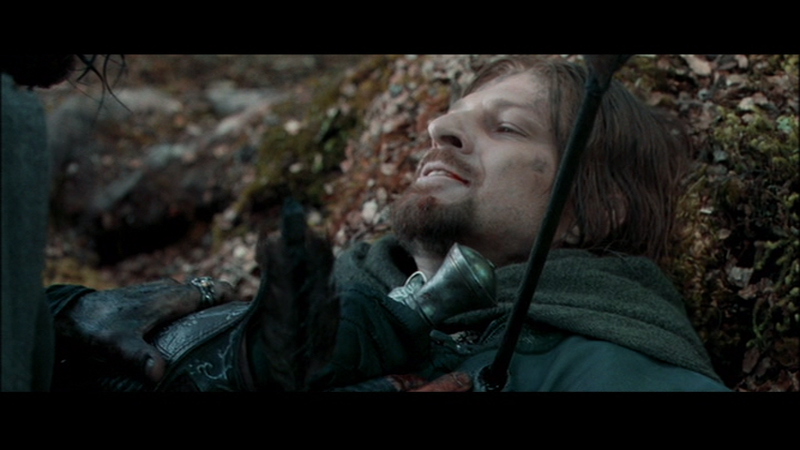 I'm not sure why, but there is something very, very powerful about Boromir's story and his ultimate end. It cuts to the core of my being whenever I watch the movie. Boromir is vulnerable, opportunistic, and especially vulnerable to the sway of the ring. Yet his character is easy to love as well. You want to like him in some ways. And when he shares his heart about dreaming of somehow saving Gondor from decline and failure, and defeat from enemies, his desire is so pure and honest. He loves his home and desperately wants to protect it. He's caught in a situation where Gondor is being systematically defeated, and he sees the ring as a weapon that might stop the destruction. Boromir leaves his shield behind as he pursues Frodo to take the ring from him. Boromir fails, and realizes what he has done, and cries out for forgiveness. 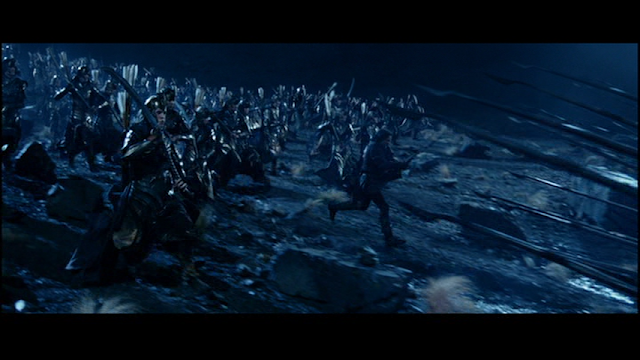 He finds himself in battle against a flood of orcs, and he attempts to defend the hobbits against them. 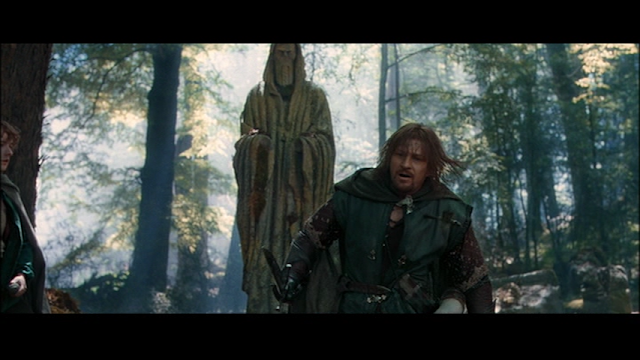 Boromir regains his honor through his heroic defense of the hobbits. But what he has done cannot be undone. He has left behind his shield, and he is pierced by arrows, and killed. He dies with his lord before him, Aragorn, and he keeps his honor, but pays with his life. And Aragorn promises to Boromir that he will protect the white city. Boromir is you and me. We all struggle with sin and darkness. We try to fight it, yet it overcomes us. We want to do the right thing, but selfishness and the desire for power leads us astray. The internal battle within the character of Gollum is of course quite telling of the struggles we all face between our desire to do good, and our desire to be self-serving. The Smeagol in each of us hopes for a bright future, but the Gollum in each of us wants what it wants. If you recall at the beginning of the third movie we see the transition of Smeagol, as he becomes Gollum over time. This is how sin destroys us over time. The most physically visible of sins is of course drug addiction, and I myself was once such as this. Just as Smeagol had a beautiful calm, rather average life of fishing in the sun with friends, just as quickly, when the addiction begins to take over, do you go from that bright spot, to madness among the rocks, and then soon you find a cavern entrance, and go underground. Your skin turns pale, you lose touch with friends and family, and your love for the drug becomes the all encompassing fact of your life. Everything revolves around it. And soon you are in darkness, in the deepest caverns, away from society, messy hair, pale as a ghost, eyes red, clutching the one ring with equal powers of love and hatred. Few ever return from this deep darkness. We see addiction playing out in Gollum, as Gollum struggles with his desire for the ring, and also his desire for friendship and love. Frodo begins to call him Smeagol and Gollum dreams of possibly becoming him again. But ultimately the desire for the ring's power wins out in Gollum. But will it win out in you and me? Too often in human history we find ourselves at helms deep, don't you think? I think of Christianity in America. We're surrounded by evil, the church is in decline, and we find ourselves a few hundred hold outs in an old citadel, under siege by tens of thousands of warriors twice our size. I think of David and Goliath. I think of England trying to hold out in World war two before the entry of the United States. So often we find ourselves as the army of light outnumbered, outflanked, and in dire straights. I wonder why that is? Well, perhaps it is because God shows his glory in our weakness. What did God say to Gideon when he gathered an army to fight off the Midianites? God says, "You have too many soldiers Gideon, you need less." And he ultimately brings Gideon's army's size down from 32,000 to about 300 (Judges 7). Think of the Battle of Thermopylae, when 7,000 Greeks defeated over 1 million Persians. (By the way, I know modern histories claim it was much less the Persians had, but modern historians are wrong about a lot today). 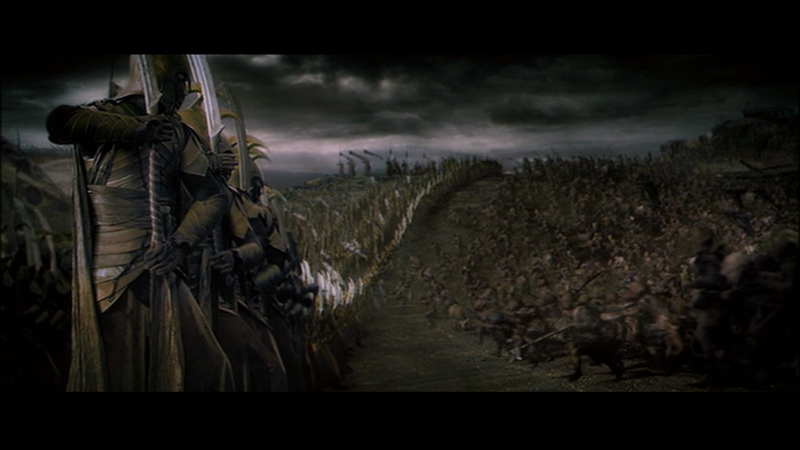 At Helms Deep we see a morally and physically defeated army gathering to try to fight an army of ten thousand. We see ourselves, defeated and trying to stand firm in the darkest times of history in our disturbed modern world of deceptions, lies, and immorality. But God does not leave us there. He sends elves to strengthen our defenses. And we fight. But we find ourselves losing the battle, despite the fact that God is with us, the trinity of Aragorn, Legolas, and Gimli fighting with us. But just when we think defeat has come, and we are tempted to give up all hope, Christ calls us to rally. As Aragorn said to King Theodon, "Ride out with me." At the end of the lost battle, we must jump on our horses and charge the enemy in one last act of defiance against evil. And when we do that we'll see the shining morning sun, and Christ coming with reinforcements to route the enemy and save us. But we must ride out in the face of defeat, and scorn the shame, and dare to boldly fight back against all evil even when it seems hopeless. At the end of the Two Towers we see Faramir struggling with a decision, to either take the ring from Frodo, just as his brother Boromir tried to do, or to let them continue on their quest. Osgiliath is then attacked by the Nasgul, and hope is dwindling fast. 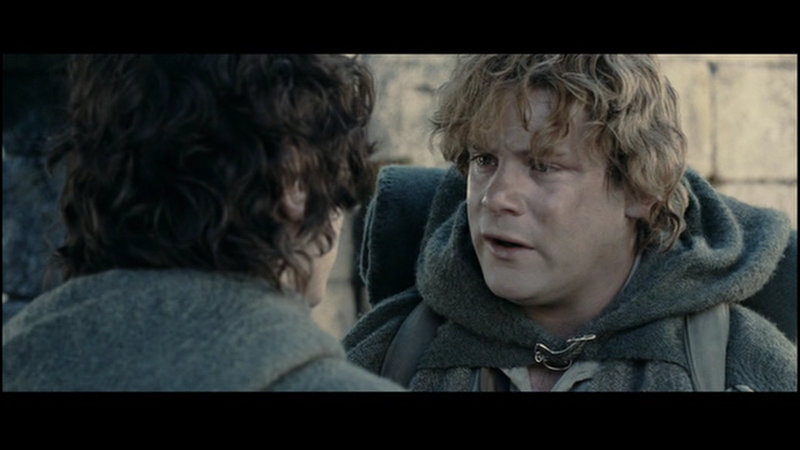 But Sam, Frodo's trusted companion makes a powerful series of statements, that changes the entire situation in a moment. "Frodo : I can't do this, Sam. Sam : That there’s some good in this world, Mr. Frodo. And it’s worth fighting for." Despite all we see in the world as Christians, and let's be real it isn't pretty, there still remains hope. We suffer everyday. We fight to live in holiness. We see people dying everyday. We see churches compromising on the truth. We see Christians persecuted in the middle east. We see Christians jailed and their churches bulldozed in China. We see chaos and disaster, hurricanes and earthquakes, abortion mills, and brutal world poverty. Yet despite all of this evil and strife and struggle, we don't turn back. We don't give up. We keep fighting our way forward, because it's part of a greater journey. And every single evil we suffer bravely through brings glory and honor to Jesus Christ. The trio of Frodo, Sam, and Gollum is quite telling. To me it represents the struggle of the believer. Frodo wants to do the right thing, but he's under the influence of the ring. Frodo is influenced for good at times by the Spirit of good, represented by Samwise. And Frodo is also influenced by the spirit of evil, represented by Gollum. It's the same for a Christian who walks in the world. He is influenced by the Holy Spirit within, yet also influenced by the world, the flesh, and the devil. In the Return of the King we see Frodo slipping more and more as he endures the burden of the ring. He is eventually tricked into abandoning Samwise. And he goes alone with Gollum. And Gollum leads Frodo into the spider's lair. This similar to when a Christian succumbs to evil. They believe a lie of the enemy, and follow after the darkness thinking they will gain pleasure or power by doing so. Instead, they find themselves wandering into a trap. Once in the spiders lair, without the help of the Holy Spirit, the believer is left alone to fight a pitch battle against a giant spider, in it's own lair. Frodo is overcome and stabbed by the spider, and wrapped in webbing. He is defeated, shackled by sin, one might say. But what happens next? Samwise comes to the rescue. Just like the Holy Spirit rescues us when we slip into sin. The Holy Spirit comes, rescues us, defeats the enemy, and saves us. Thanks be to God for that. Sometimes, when the battle is hard, and the warring has been going on so long, and you've found yourself battling a great and mighty enemy, you must march out with all you have and make war at the gates of hell. So it was when Aragorn finally embraced his destiny as king. 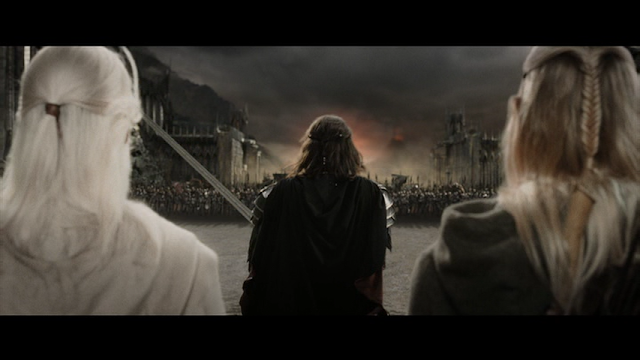 Having gathered the forces of Gondor and Rohan, he marched his army against the gates of Mordor. They fought the enemy at the black gates, and if you noticed they were terribly outnumbered, but it didn't matter. Their armor shine brightly, and what caused it to shine? The overwhelming evil, the eye of Sauron pointed angrily upon them. When we fight defiantly, despite being outnumbered greatly, we often shine brightest when we stand in the face of evil. The evil we fight forces out the very best in us. 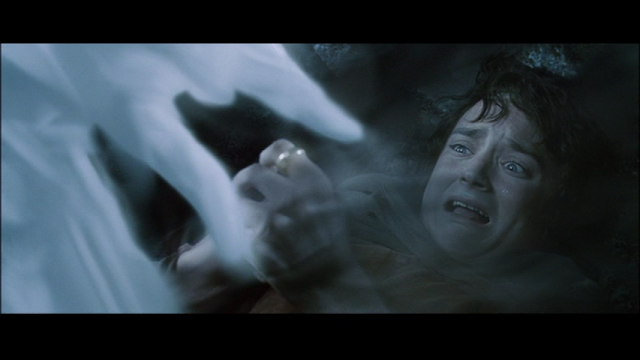 In the final moments of the series we see that Frodo finally falls completely to the darkness and temptation of the ring. He takes the ring and puts it on, which causes him to disappear. It's interesting that one disappears when they put on the ring. It's much like sin causes us to disappear piece by piece, part by part, until we are only slaves to sin. We are gone, sin only remains. Obsession takes total control. Gollum attacks Frodo, they fight for the ring, and Gollum falls to his death, taking the ring with him into the lava. Frodo is hanging by the cliff's edge. 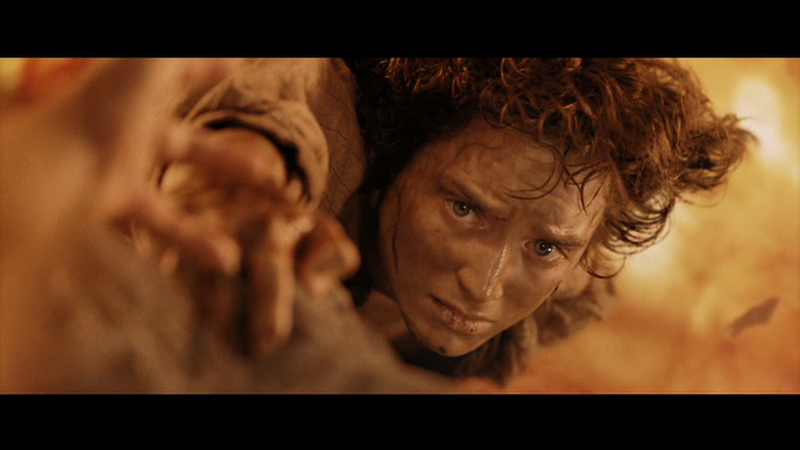 And Samwise reaches out to help him up. This is much like the situation when one gets saved by Jesus. We suffer, struggle, clutch to our sin so stubbornly. And when our sin finally turns on us, and ruins our lives, we are left hanging by a thread above a pit of burning fire. But God doesn't leave us there. Just as Samwise reaches out his hand, insisting Frodo takes it, so God holds out his hand in Christ Jesus begging, pleading with us, insisting with us that we take the free gift of Christ Jesus. We can see in Frodo's eyes that he wants to let go. He doesn't want to be saved. He wants to fall to his death, because of all he's been through. It was much like this when I got saved... I didn't want to have to come back. I wanted to die. But the Spirit, just like Sam, called out to me: "Don't you let go! Don't give in! Reach!" And I reached out my bloody hands to Christ reaching down to me, and I took his hand, and he led me out of the caverns of fire, and into the safety of eagles wings, rising me up, higher and higher, to safety.